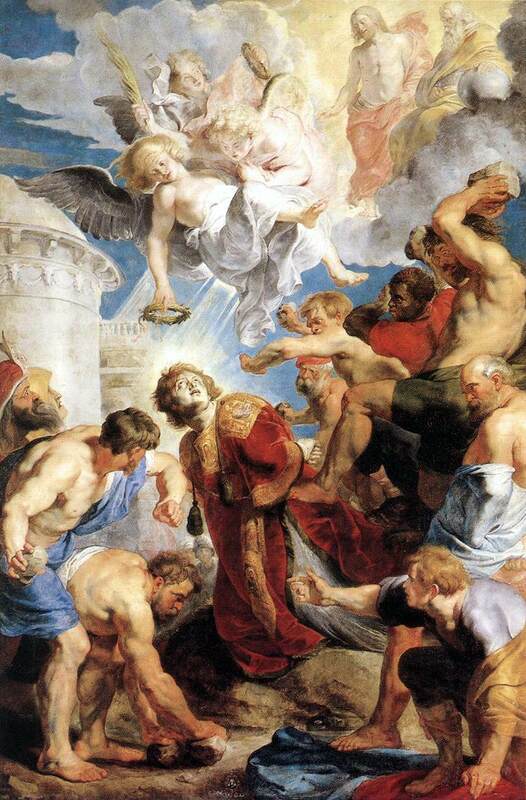 Today is the Feast of the Martyrdom of Saint Stephen. For speaking truth, for bearing witness to Jesus, Stephen was stoned to death. Saul of Tarsus, prize student of the great Rabbi Gamaliel, stood by and approved. He can be seen standing with stony approval to the right in the painting. We know what happened next, how Stephen upon seeing Jesus at the Right hand of the Father prayed this sin not be held against his murderers; how Saul, later Paul, would be converted from his single-minded mission to exterminate this new sect, to spreading the Gospel all over the world. Note the crown of martyrdom being given Stephen. Also note a second being held back in the distance by another angel-that one meant for Saint Paul. We see plenty of Sauls-turned-Paul in the pro-life movement. Norma McCorvey of Roe, Dr. Bernard Nathanson-both of whom converted to Catholicism. This year, Abby Johnson walked out as Planned Parenthood clinic director and joined those on the demonstration line. They all share something in common with Saint Paul. They were prayed for by those being arrested, being ridiculed for their fidelity to the Lord. It wasn’t Ivy League apologetics that swayed them. Perhaps that’s why, writing years later to the Corinthians, Saint Paul said, “I can speak with the tongues of angels, but if I have not love, I am a noisy gong, a clanging cymbal”. There’s a lesson in that for us in the pro-life movement, and here in the pro-life blogosphere where passions can run high. For my part, I will not tolerate incivility on my threads, from either side. We can disagree without being disagreeable. Above all, we must pray. Stephen was the first of many martyrs to follow. So many in the pro-life movement suffer martyrdom on many levels. I’ve been ridiculed roundly, as have so many others. That doesn’t bother me anymore. I’ve moved on to a place where I simply cannot grasp how others can’t see, won’t see the intrinsic value of an individual human life, without regard to form or function. And so, at this juncture, I’m left with one certain truth. for we are celebrating Stephen’s birth into heaven. He knew how to pray even for those who were killing him. Thank you for what is going to be a fantastic blog. So…Stephen called them pagans, essentially. Murderers. Opposed to the will of God. Thank you for the kind words about the blog. I will be great having you. Please comment as often as you like. When necessary, there’s a strong Stephen streak in me that I can trot out if so needed. Hope your Christmas was every bit as wonderful as mine. I came over from Jill Stanek’s site. So glad to see you are doing this blog, and I love this post. Can’t wait to see what comes about on St. Gerard’s Day! Merry Christmas, and much joy and peace in the Infant Jesus. Thank You, and a Merry Christmas to you as well. Thanks for stopping in, and yes-I’ll have something good on my Patron’s feast day (my middle name is Majella-Mom and Dad gave me the whole name!). Thank you for posting the beautiful picture and also the explanation of St. Stephen’s Martyrdom. I do agree that we need to Pray, Pray,Pray. Your concluding prayer is beautiful, St. Stephen even prayed for those who were killing him. That reminded me of another great saint, St.Maximilian Kolbe, who was martyred at the Auschwitz concentration camp. We all need to pray for courage and that our faith will be strengthened through the difficult times in our life. God Bless you and guide you always. Today I was writing a post about the Slaughter of the Innocents and the pro-life cause, but I hadn’t seen the parallel with the martyrdom of St Stephen. Thank you for the insight. I suppose ifyou are in the pro-life movement opportunities for martyrdom, both bloody and unbloody abound, we must be prepared, through prayer to accept the mistreatment in love. Love is the net used by Mother Teresa to catch souls.